Having a stash of versatile kits in hues that compliment the vintage palette is valuable for all Heritage Scrappers. You want to be able at add intensity to those wonderful browns, greens and grays that are so important to Heritage kits. My new collection "Somewhere" is just the right punch of deep color to add a spark of excitement to you vintage layouts. We sometimes forget that our ancestors loved color as much as we do. We forget because we are looking at black and white or sepia toned photos of them! If you should be lucky enough to own a fabric from the past, they have often faded to a soft brown and unless you knew what the original color was you might be tempted to think it was always brown. Did you know there are web sites and books that tell you the "popular" colors for clothing in the past? They are wonderful resources to assist with colorizing photos, for those adventurous enough to do so! 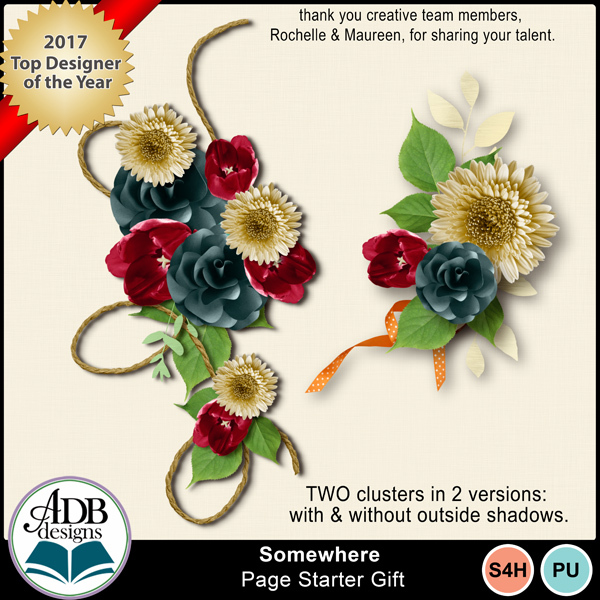 I just add color by way of the accents on my pages and leave the photos as I received them, and my Somewhere collection is perfect for that! What is your favorite color to wear? Why? Do you know the favorite color of you mother or grandmother or other relative/ancestor? How did you find our this information? Is there a great story to tell? How do different colors affect your moods? How does color inspire you?